One of the keys to Kunihiko Ikuhara’s success is his ability to surround himself by creators who fit his aesthetic but also thematic needs, no matter the artistic field those people belong to. So while his upcoming TV series Sarazanmai is still a ways to go, there’s a lot we can infer already, and much to analyze about the way he operates. Following the celebration campaign for Revolutionary Girl Utena’s 20th anniversary, a special livestreaming event was announced for early March 2018. 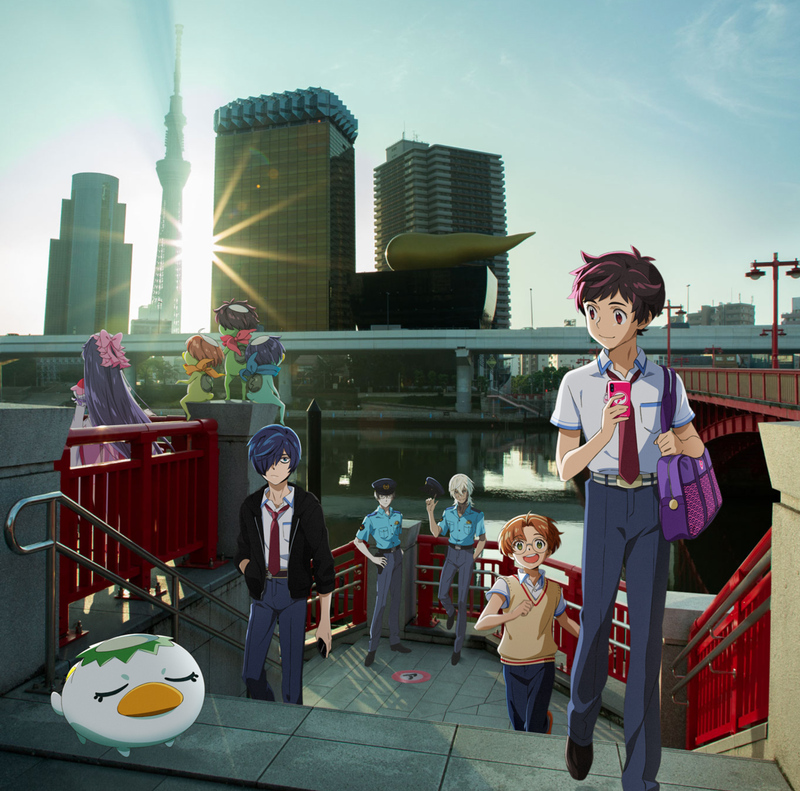 It covered the entire series in 3 sittings, and at the end of each day, a teaser for Kunihiko Ikuhara’s upcoming series Sarazanmai was unveiled. Much more has been revealed since then – its broadcast next Spring season on the noitaminA slot, the already ongoing manga serialization, its main staff, and so on – to the point that it’s worth recapping the most important points so that people know what to expect. Now, playing the guessing game with Ikuhara is a risky business, even when his titles are already being broadcast. Few anime creators can boast of careers built around a social ethos that’s made as much of a splash as his own, but he’s not always delivering his messages in a straightforward fashion. He relishes the attention, and yet he’ll often be secretive and reveal details in restricted fan meetings, under the promise to keep quiet. In that sense, Sarazanmai is being teased following the model he’s grown so comfortable with: taglines and promotional videos present themes distilled to their simplest form (connections, desire) and just enough hints to speculate about what those will develop into (personal relationships in modern interconnected society, using his first bout with an almost all-male cast to dig into BL tropes?). He’s encouraging fans to solve the puzzle before he even gives them all the pieces, but if things go right, we’ll all realize that the message was there all along. While there are risks to trying to figure out Ikuhara’s plans in advance, then, there are already many decisions to interpret here. The thematic (though not always narrative) tightness of his works is far from an accident after all: Ikuhara deliberately gathers teams of creators with very specific needs in mind. He’s one of the greatest scouting figures in the industry, no matter the field, and he’s not afraid to reach out to non-anime spaces to find the talent he seeks. His lasting influence on artists he collaborates with is well documented, though I get the feeling that fans have yet to grasp the full extent of that; that Takuya Igarashi’s modern work at BONES is entirely built on what they learned together at Toei ages ago is common knowledge, as is the fact that many Ikuhara quirks are still present on Mamoru Hosoda’s films due to the impact Utena’s production had on him, but they’re just a couple of the many creators whose entire careers changed after meeting him. One of those is very relevant: Nobuyuki Takeuchi, appointed as Chief Series Director for Sarazanmai. Acting as a regular supervisor on Utena back in the day granted Takeuchi a new understanding of animation as a whole. He started applying his technical proficiency with a broader perspective, thinking not just about the animation but how to present it. 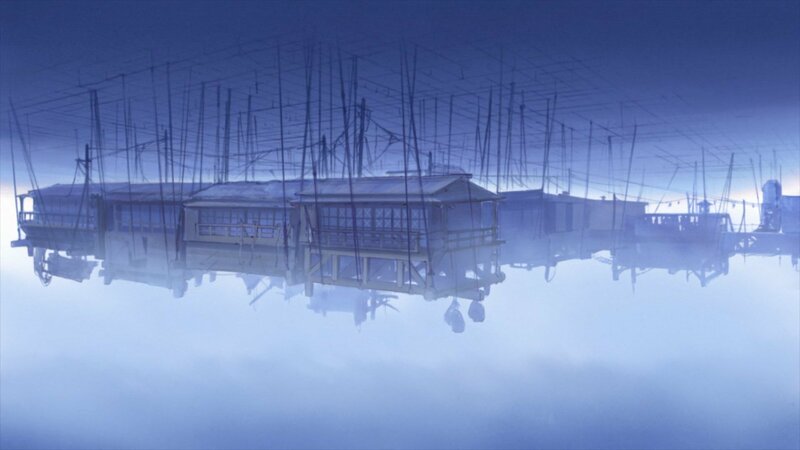 He embraced the staged feeling that characterizes the Dezaki school of direction which Ikuhara draws from in the first place, and imbued SHAFT’s works with it as he became an essential figure at the studio. His design work incentivized this kind of approach, placing the audience in an allegorical theater that can be a dazzling stage or a small private performance we voyeuristically peek into. 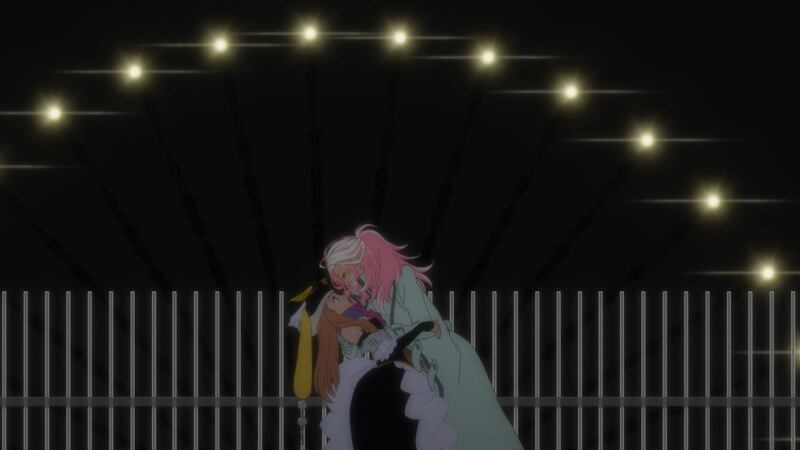 After leaving his imprint all over the presentation of franchises as successful as Monogatari, Takeuchi’s parting ways to meet an old acquaintance, and hopefully match if not beat his magnum opus – Mawaru Penguindrum #9, which he storyboarded, directed, supervised, and solo key animated. Takeuchi’s involvement follows a common pattern; Ikuhara’s once again relying on someone who’s compatible with his distinct style and yet possesses a strong personality of his own to act as second in command. However, chances that those two won’t be the only important directorial figures in Sarazanmai, since Ikuhara’s also developed a particular fondness of molding promising youngsters to his liking. If we look back at Penguindrum, the chief director seat was occupied by Shouko Nakamura, who at the time was still making a name for herself as director but was already recognized as a leader of Gainax’s female faction. By no means as much of a veteran as Takeuchi, but not exactly a newcomer either. Hers was a relationship on equal terms more than a purely instructional one. There’s no denying that it did help her a bunch nonetheless, and since then become a renowned director (issuing our monthly reminder to watch Doukyuusei). If you look more attentively, however, you’ll notice a bunch of smaller success stories born in that production. Individuals who had no directorial experience whatsoever and grew a lot as Ikuhara placed heavy responsibility on them. Tomohiro Furukawa, who’d go on to co-direct Yurikuma Arashi with him and recently headed the dazzling Revue Starlight. Katsunori Shibata, who’ll be returning to Sarazanmai as concept designer after gaining enough caché to collaborate with the likes of Masaaki Yuasa. Even Dogakobo-affiliated Mitsue Yamazaki, who’s yet to find the right project to showcase the extent of her skill, grew a lot as Ikuhara’s assistant. One of the many pleasures of following his series in real time is watching him find new voices and guide them to eventual success. 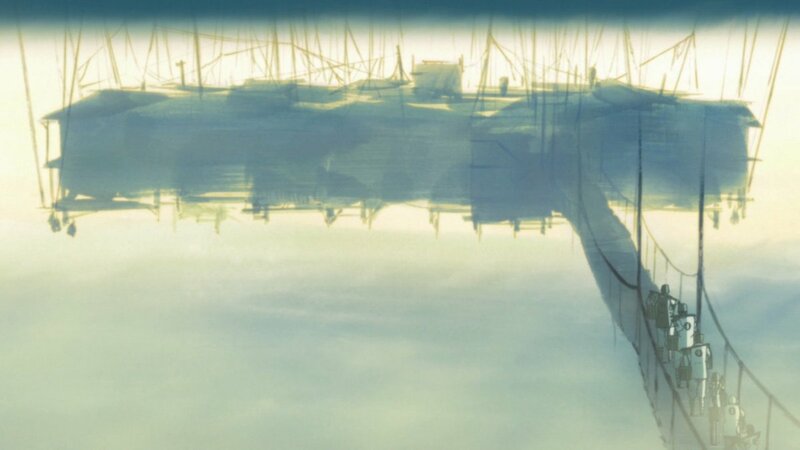 Furukawa took the idea of staged direction very literally for his series direction debut. 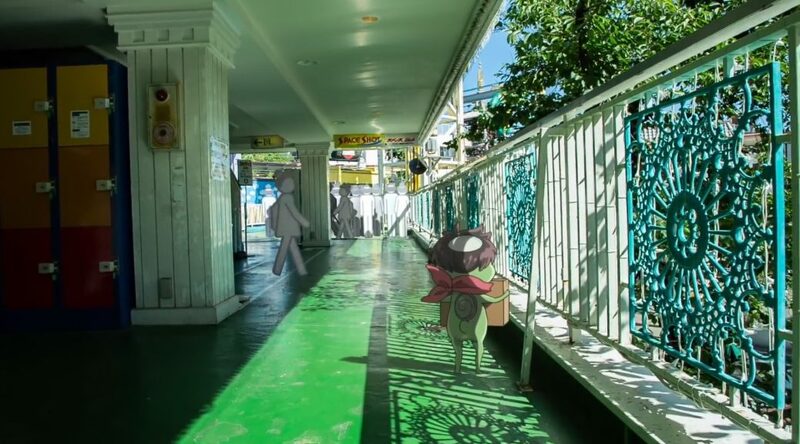 If we return to things about Sarazanmai in specific that we know for a fact, its recent promotional push offers a lot of interesting information. For starters, Ikuhara’s now collaborating with filmmaker Tao Tajima, attached to graphic design company TANGRAM. 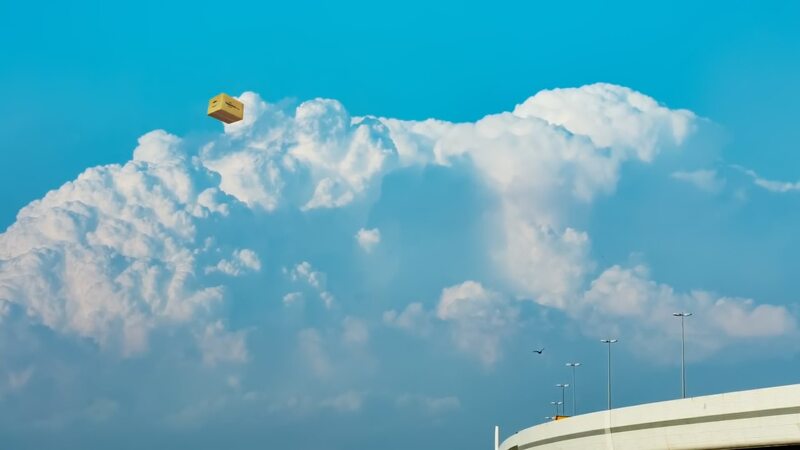 Tajima directed 5 interconnected promotional videos – how thematically fitting – that only became whole after all of them had been streamed. 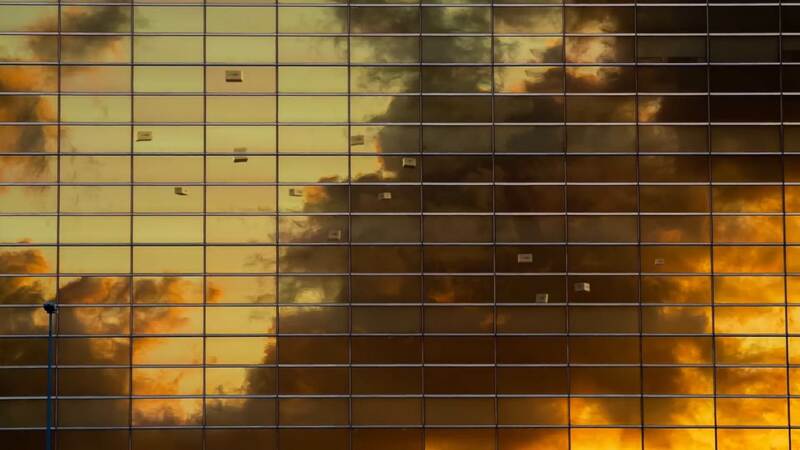 His work, especially the personal pieces, is characterized by urban live action settings that he turns into slightly fantastical landscapes via editing and lighting, often highlighting the modernity of it all. Mundane buildings become fantasy forests of concrete and steel. That visual take on magical realism isn’t only compatible with Ikuhara’s usual multilayered approach where outlandish allegory coexists with quirky daily life, it also seems tailor-made for Sarazanmai. 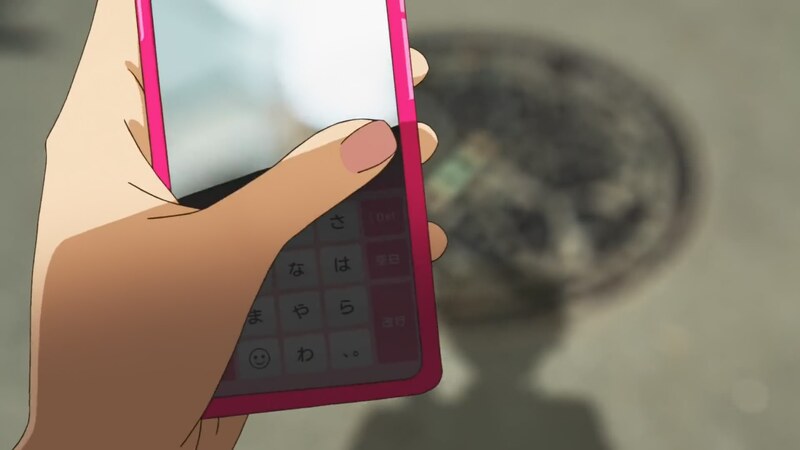 The theme of connections, the central character constantly checking his phone, Ikuhara’s vague comments regarding materialism, even the Amazon-like entity that appears to play a role in the series are all aspects that tangibly root it in the current state of our (or rather Japan’s) society. In the same way that companies like Sony have sought Tajima’s talent to create commercials that embody the modernity of their products, Ikuhara appears to have done the same for a show that should be tackling society as it is right now – although I should learn my own lesson and not try to guess the full extent of his message beforehand. Were Tajima’s work limited to these PVs, all of this would have remained a simple curiosity. But considering that the first proper key visual for the series follows that exact same aesthetic, chances are that it’ll play quite the important role in the show as well. And that’s not new either: like we previously mentioned, Ikuhara’s grown fond of recruiting artists from non-anime spaces and building an aesthetic around them. We already saw that with Penguindrum and Lovedesign’s graphic designer Wataru Okabe, whose iconography is so integral to the show’s identity that it’s one of the first things that comes to mind when fans recall the show. That experiment worked out so well that Ikuhara will be bringing him back for Sarazanmai, as became fragrantly obvious the second it got announced. There’s no mistaking that typography and extremely stylized imagery. But while I doubt anyone will object to Okabe’s return, Tajima’s potentially heavy involvement is another issue altogether. The cartoon elephant in the live action room here is that the aesthetic of those PVs is divisive, with people who love its (not really) new approach and those who are very put off by it. Should you give up on it if that aesthetic appears to be a dealbreaker for you? Absolutely not! And I don’t mean this just in the sense that expanding horizons when it comes to your hobbies can be very rewarding (did you know I was initially not fond of Naoko Yamada’s work at all? ), but rather because that’s not actually what the show will look like for the most part. So what will the aesthetic be like, then? I can’t give you an exact answer – at least not without personally approaching the staff and breaking more rules than I’m comfortable with – but giving a decent approximation has become easy enough. After all, it was revealed that Sarazanmai’s art director is Studio Pablo’s Ayaka Fujii. 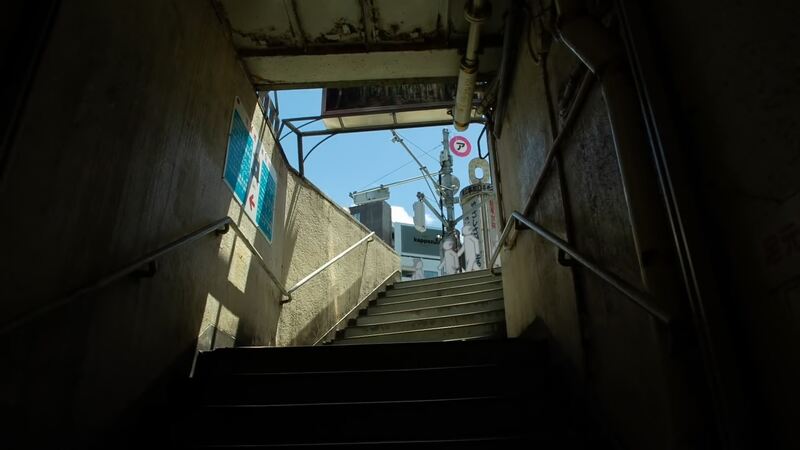 Pablo is undoubtedly a well regarded background art company, especially their traditionally painted pieces, but it’s worth acknowledging that they’ve been struggling to find alternatives for their president and star art director Kentaro Akiyama. 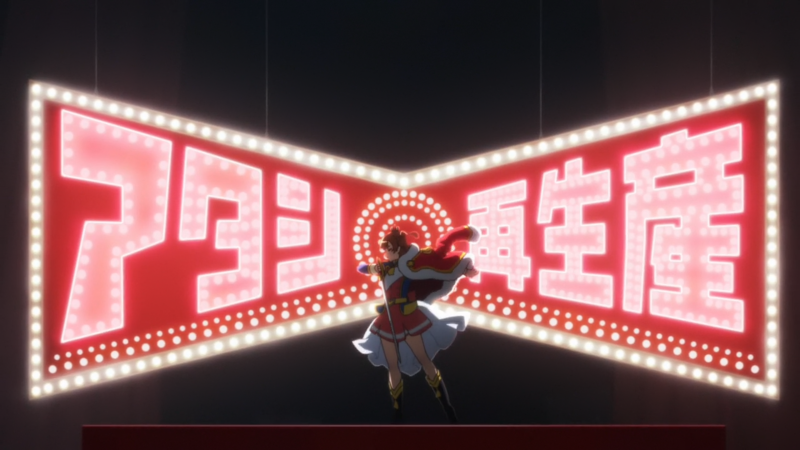 While their work is never poor, titles that are mainly in the hands of other individuals like Isekai Izakaya “Nobu” and even Revue Starlight lack that special glamour to their scenery that made them into the one art company fans are aware of. Pablo’s excellence in a declining field like traditional background art cause them to be in obscenely high demand (they’ve been booked until 2020 for quite a while already), but it’s precisely that success that’s causing some growing pains. It’s not all bad news, however, as some of the staff promotions have turned out to unveil excellent new art directors – look no further than ACCA’s Seiko Yoshioka, and fortunately for Sarazanmai, Fujii herself. 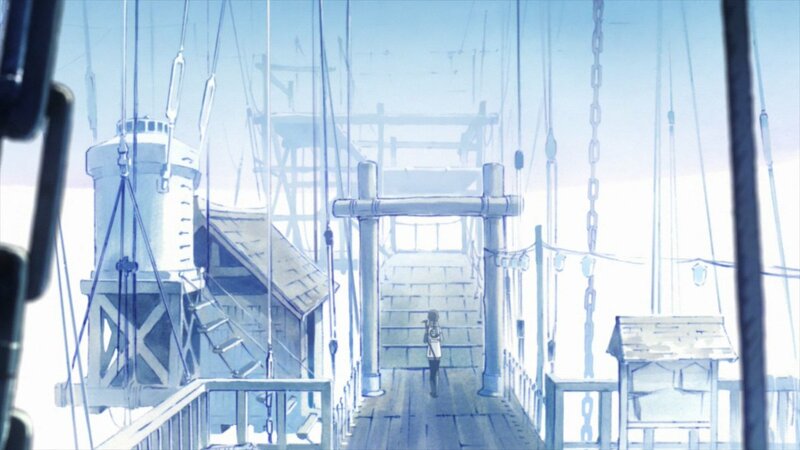 She already caught my attention with the uncluttered, painterly world of her debut work The Dragon Dentist (TV), and her contribution to FLCL Alternative more recently seems to be one of its salvageable elements. Considering that live action footage will still be used in some capacity, though, perhaps we’ll be seeing something more dense scenery to avoid whiplash, closer to the interior shots in her first series. Considering Penguindrum was Akiyama and Pablo’s first exceptional title, there was no doubt they’d leave this in good hands. 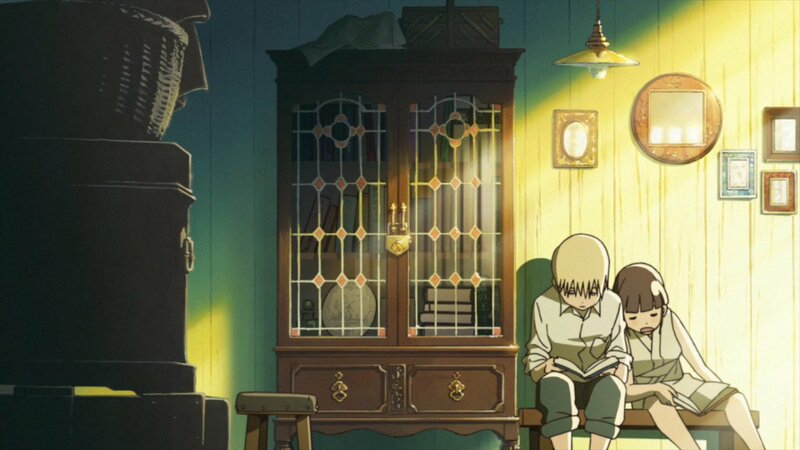 The impossible architecture and gorgeous color work made Fujii’s art direction debut on The Dragon Dentist (TV) all the more memorable. Since we’re talking about the companies involved in the production of Sarazanmai, it’s worth noting who’s actually behind this title. MAPPA’s name is the one that’ll be in every fan’s mouth, since they’re the bigger and more recognizable studio – and the ones that leaked the existence of this project in the first place, by hiring management staff acquainted with Ikuhara’s work for a project that was at the time unnamed. They’ll be providing a bunch of staff for sure, but if you’re looking for the creative core, you should be looking at the other company co-producing the series: Lapintrack. That tiny little studio – only 7 employees according to their own website – is Ikuhara’s current home in the anime industry. 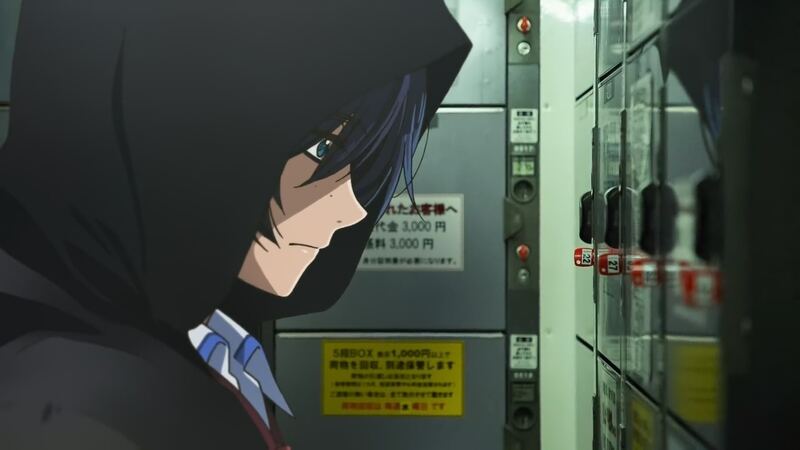 When he returned after his long break he assisted old acquaintances like J.C. Staff, and eventually settled on working alongside Brain’s Base, which at the time was bursting with skillful directors like Takahiro Omori. But good things don’t last forever, and once the unique creators started leaving, no one could stop the studio’s hemorrhage. One of the lesser noticed talent leaks at the time involved a handful of writing and management staff going on to found Lapintrack. The studio’s done various outsourcing jobs, but it wouldn’t be much of an exaggeration to say that they exist for Ikuhara’s sake; they produced 5 episodes of Yurikuma (about as many as the “main” studio SILVER LINK), and chances are that they’ll be in charge of many Sarazanmai ones as well. They’re the first entity to keep in mind when it comes to modern Ikuhara anime! It’s my duty to remind people that Sarazanmai‘s animation designer Kayoko Ishikawa collaborated with Sayo Yamamoto for a short film part of the Toruru’s Adventure anthology, which vanished from the planet after brief screenings. To wrap up the coverage of Sarazanmai’s known staff and what that means for the future of its production, there are a few more names we should quickly go through. I’d get both my sakuga club membership and Aikatsu card revoked if I didn’t mention animation character designer and chief animation director Kayoko Ishikawa. Though her adaptation of Migi’s original concepts is pleasant enough, I’ll be honest and admit that the most exciting hypothesis is the possibility that she could be directing an animating an ending sequence all on her own, like she did over and over for Aikatsu. And since I know just how many people who follow the site are fans of her, I’ll remind everyone that Ishikawa’s best friend and collaborator is none other than Sayo Yamamoto. While she’s busy with her upcoming movie, that bond and MAPPA’s involvement means she might lend a bit of her time to Sarazanmai as well – so we could have right about the most kickass combination of opening and ending sequences. We could be here all day talking about smaller but still significant details about the team. The participation of Korean animation studio Makaria, one of our favorite new players in the anime industry, is all but confirmed. Animator and illustrator Maimu Matsushima, concept designer alongside Shibata, is rumored to have started her career at Kyoto Animation and departed during their mid 00s exodus. The show’s yet to start and there are already plenty of interesting names capable of influencing the production. We’ll return to them if they become relevant when the show begins, but giving you a list of individuals wasn’t the point here. What truly matters is the way Ikuhara deliberately surrounds himself by creators who fit his aesthetic and the message of his works, to the point that there’s much to infer before the broadcast. And Sarazanmai is no exception! Still hope there will be significant female characters in the cast. I’m going to guess right off the bat that Ikuhara is going tackle male online toxicity, and that will be the “lust” part. Sara (the baby the cops find and take care of in the manga) is the magical girl in the key visual and appears a few times throughout the teasers, so her role should be important. Plus she’s obviously part of the 50 layers of wordplay in the title itself. i dont know about male online toxicity. The synopsis of the show just came out, so its definitely not about that. Still no reveal on the “prominent” female character either. What I find most interesting about the AGF reveals is that it’s actually… well a fairly straightforward reading of the themes they hinted at since the start, especially when it comes to communication in the current social media age – which makes promotion stunts like the twitter account they’ve set up for the cops a pretty neat move. We all know how much Ikuhara loves allegories, but in modern years he’s been fairly sincere and straightforward when it comes to exposing what he wants to talk about.